Linch Hill as a carp venue needs no introduction, these days the fishery is well known as having one of the best syndicate waters in the country with Stoneacres, as well as two of the finest big-fish day-ticket lakes; Willow Pool and Christchurch. 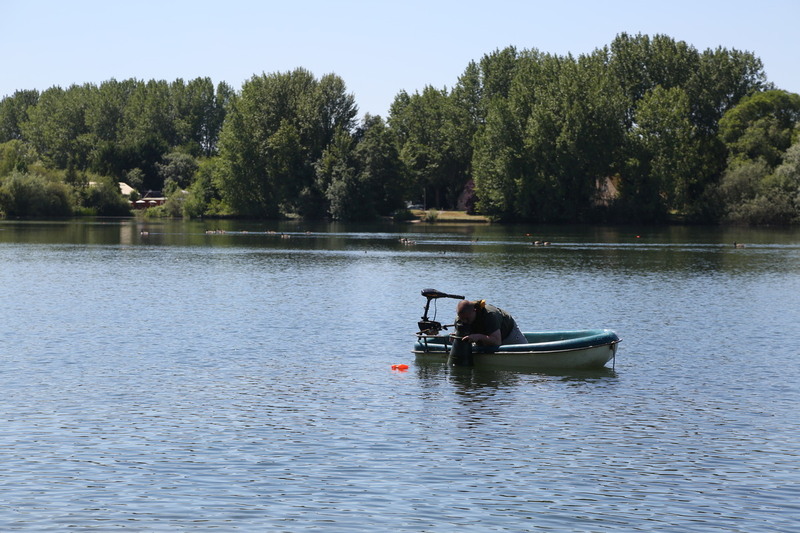 In fact, a good few years ago now I was first attracted to the many targets that Christchurch held – stunning carp and if you’re your looking for a big PB its definitely the place to go. Although to barrow down to ‘Christy’ you have to pass one end of Stoneacre, where there’s simply no way you cannot be drawn to the idea of taking on that challenge. At around fifty-acres in size, jam-packed with weed and holding carp that have been fished for by some of the sharpest anglers around, the challenge is plain to see. Much of the fishing on Stoneacres in recent years has been well documented, and by a few mates of mine in some cases. This is helpful in giving you an idea of what to expect, but it’s also difficult to try and remain unaffected or influenced when you prefer to keep to what you know and your own way of fishing. That’s how I like to fish. Nothing too complicated, just nice and simple that’s what works for me, and when the time came to turn my attention to Stoneacre it’s an approach that’s been serving me well. In my first season I landed 11 carp, which considering I fished a lot less nights than most (just 22) I was really pleased. The simple approach I’ve mentioned was working just fine, and I’d learnt that the real problems when it came to ‘Stonie’ weren’t so much what rig you used or anything like that. It was more a case of surviving the challenges of the lake itself! Drifting weedbeds wiping your rods out, learning how to use your boat, quietly and at the right times, and of course trying to do your thing when there’s also a head of good anglers around you trying to do the same. Like I said my approach is simple and not that I’ve tried to be different, my simple take on fishing the lake hasn’t really been the norm. For example: most anglers look for tiny spots within the weed, often-small silt patches, which being able to drop rigs from your boat are a viable option. Well that is until around mid-summer time when the algae growth remove most of the water visibility. In complete contrast, I’ve kept to the large clear, clean patches of gravel and bars within the lake. Obvious spots I know, but I’m catching fish from them so why change, and in my opinion over think things. Again this year, well so far anyway, this approach has kept the bites ticking along, and I’ve been lucky to land some of my targets. Fish like the elusive ‘Ghost Common’ and ‘Nemo’, I’ll never forget that battle that fish gives. 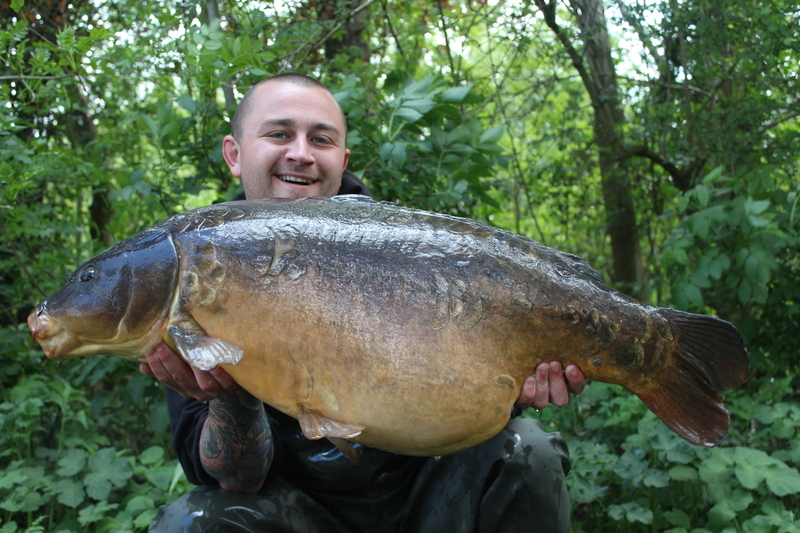 The biggest highlight this year has to be landing ‘Baby Choco’ at 40lb 10oz, a stunning fish that blew me away. One thing that I feel has really helped maintain a simple approach has been fishing boilies. Stoneacre contains some colossal tench, which can be a real pain at times – providing you with little more than a single bleep at range before burying in the weed to sit until you reel in or worse still boat out to the weeded rig disturbing your swim in the process. As yet (fingers crossed) I’ve yet to hook a tench, I think because I’m one of the few on Stonie not using particles. 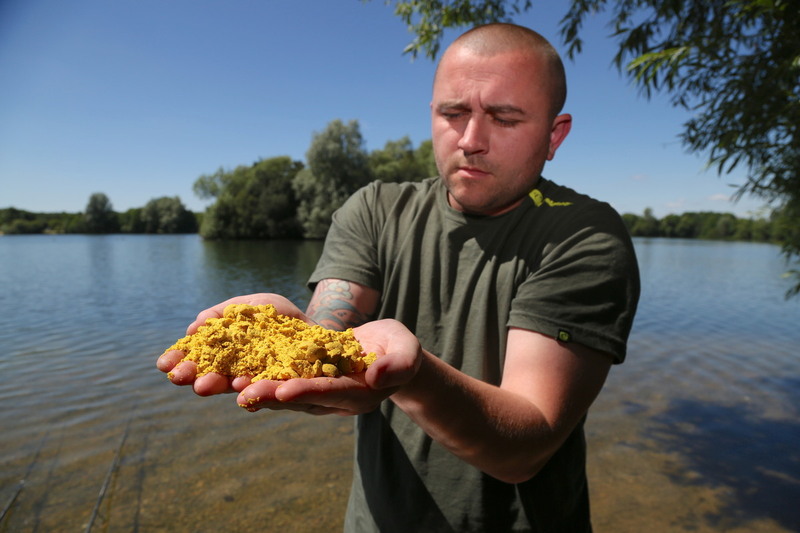 Don’t get me wrong carp love particles, but to me the fact that this raises the chances of also attracting tench is too big. So I keep to my boilie only approach, although that doesn’t mean you can’t mix things up a bit for an edge, and I literally mean mix it up. I don’t like to fish just one type of boilie over a spot, I like to mix together two or three different types and in some cases will then fish a different flavour hookbait again over the top. In the main this is simply to present boilies of various colours, where I’ve been using a mix of Cell (Biscuit colour), Hybrid (red) and Essential Cell (yellow) that I’ll also crush as I like to use a small hookbait. Despite the difference in flavour, these freezer baits from Mainline are all food source style baits and all made to react in the same way once in the water. 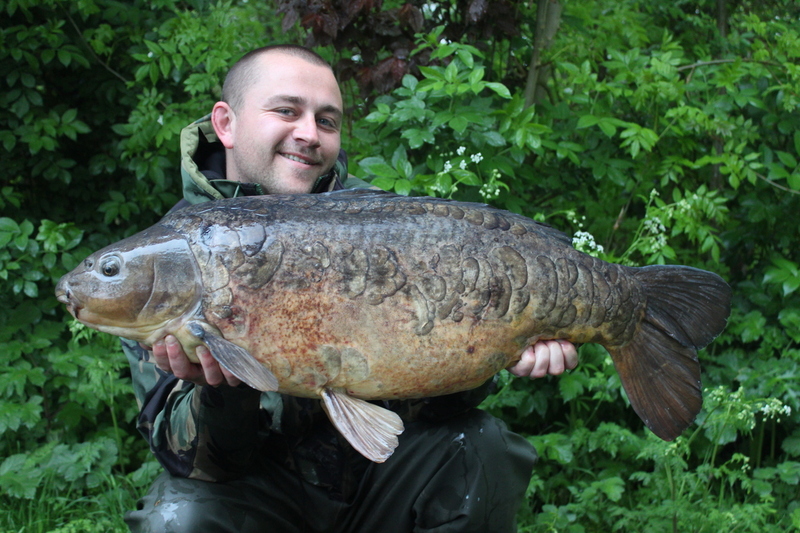 So all work perfectly mixed together and maybe give the carp something else to think about. 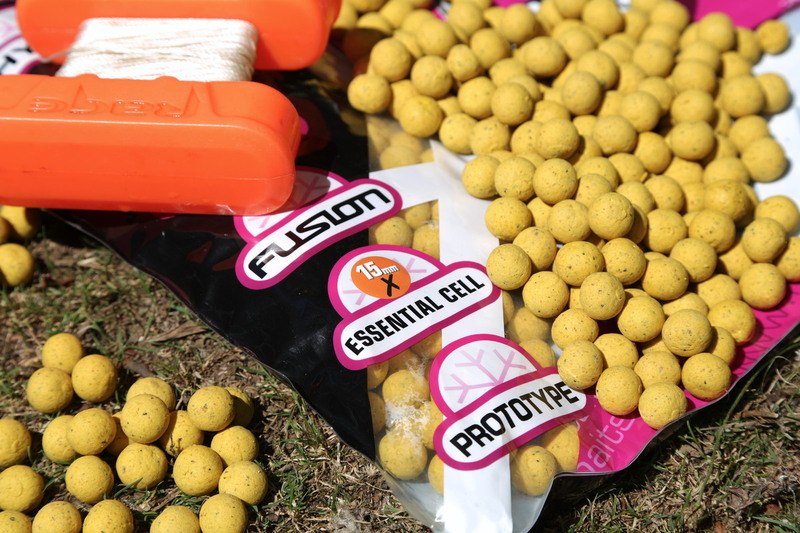 Bait-wise the thing I would consider an edge is using the Balanced Wafters from Mainline – 12mm Hybrid and Cell have been two of my favourites. They present perfectly over gravel – lying close to the deck and giving an appearance much like the free offerings around it. Ordinarily pop-ups and weedy waters go hand-in-hand, so again I think this presentation and part of my approach is perhaps something the carp aren’t especially wary of. Maybe it is or maybe it’s just what gives me confidence, nothing in carp fishing is set in stone so to speak. Either way I certainly won’t be changing anything soon. I’m catching consistently and that’s all that really matters, and hopefully will keep on bringing the special carp of Stoneacres to my net! 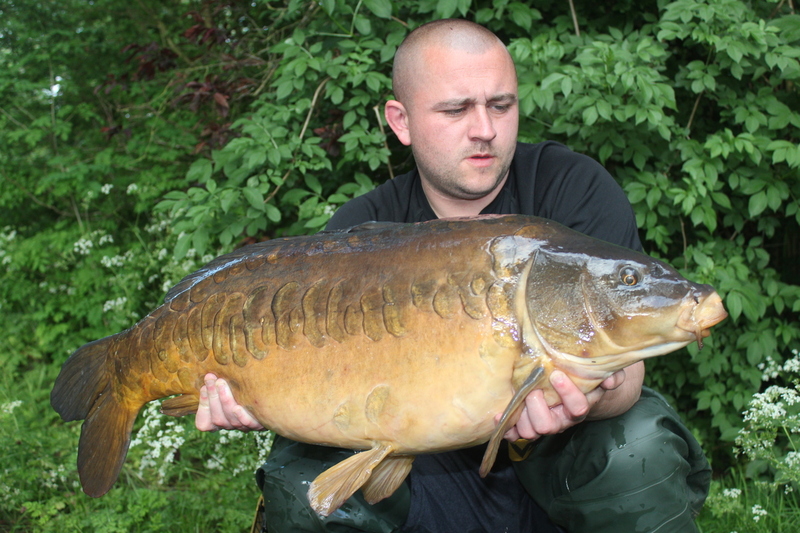 The highlight so far has to be landing Baby Choco at 40lb 10oz! 12mm Balanced Wafters – now these are an edge! I won’t be changing anything while the bites and fish like this keep coming along!